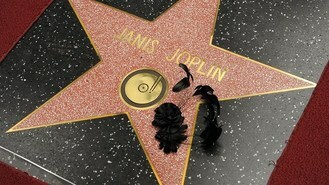 The unveiling was celebrated by country music star Kris Kristofferson and record producer Clive Davis, who signed Janis when he was president of Columbia Records. The pair joined Janis' sister Laura and brother Michael after Kris performed a special tribute of his song Me And Bobby McGee, which scored Janis a number one hit after her death at the age of 27. Addressing the crowd, who broke out into a rendition of Janis' song Mercedes Benz, Laura said: "I would like to remember that Janis had a huge heart that she poured into her music. "She was someone who knew how to have a good time and liked experience, I like to think that this star allows her legacy to have a new experience just like she had when she was living." Grammy-winning music executive Clive Davis added: "This contradictory chick was at the top of the rock world, she was unapologetically herself and everyone embraced that and Janis would have got the biggest kick out of being on the Hollywood Walk of Fame. "Think of what it was like when she was growing up, stars were glamorous and polished, conventionally beautiful creatures and Janis wasn't anything like that. "But that didn't matter, she helped us change what we perceive star quality to be and I'm so glad this star is going to be on this street for everyone to see."